Spott-gloss and debossed!? Is it my Birthday? Time to get rid of my BF's 1/4 slip! Looks great, Tony!! The legs are cropped as they're not visible in the still the pose was taken from. And I so wish that ALL retailers would provide us such informations afore. Thumb up Kimchi! How did I manage to miss this release coming? 1. Zavvi Lenticular - great artwork all round. 4. This one simply because there are no other characters except Cap pasted all around. The Blufans is nice but imo the steel isn't as good as the WWA steel. Now that one is gorgeous and glossy. Blufans' pales next to that and honestly, judging from Kimchi's TWS steel the Blufans one is gonna pale next to this here too. And this is just the steel. The slips will knock it out of the park, I'm sure. Don't really like that one tbh. Two huge heads plastered on the steel just isn't how I want this movie represented. I mean, the art is nice but the overall presentation makes this my least favourite. 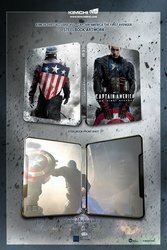 Yeah I remember ordering it with a ZBOX, I'm one of those people who keep the steelbooks sealed. Like you said the Zavvi editions are always a good investment. Cheers mate but clearly I'm in the minority but this looks garbage. Art is rubbish and nothing on the original HMV steel or the zavvi lenti art used. Looks nice, but the fact his legs are cropped on the back kind of ruins it IMO... they should've just zoomed in on the image to fill the gap along the bottom. I mean Cap Am is larger on the front anyway, so having him a similar size on the back would actually look/match better. The original HMV steelbook is still my favourite! Lol I didn't even notice that before. I started reading through the previous pages once I made my post and see a few already mentioned the cropped legs... honestly, I'm surprised Kimchi didn't pick up on it themselves and are happy to release it looking that like. As I said, this artwork is like wow at the first glance but once you start diving down, it is not that great. If you have the Zavvi Lenticular you can easily sell that and buy 2 copies of this lol. Kimchis winter soldier was amazing but this is a huge step backwards.